Ever since I was a child I’d been to Mildred for anything you can name—drops for toothache, herbs to ward off hoof-and-mouth (you fasten them on the off hind leg with a special knot), and readings, of course. A couple of years ago, she told me I’d have a child before the next spring, and it happened, alright. Only one of the eight cousins to give birth so far, and I’m the youngest. My mother and aunts had just about given up hope of a baby in the family. It’s the way of things now, since the war and all the problems with the air and water. Maybe Mildred helped it along—threw in a little something extra, since she knew I wanted a child. If anyone could do it, it was Mildred. She’d been practicing for over seventy years. It’s forbidden, of course. The Council decided the wise women can foretell birth, but they can’t bring it about by spells. That was their one and only attempt to assert control. And the penalty for defying the Council’s order is death. But Mildred wasn’t one for following rules she thought were silly, especially if it stood in the way of her helping someone. She was just like that. There’s a saying in town, you find your wise woman and only then will you find your true love. But Mildred and I go back long before I had any thoughts of love at all. She put a special charm on my first bicycle. And I never had an accident with it after that. My cousin Sylvia, now, she went to Agnes for spells, and her bicycle frame was warped in four months. That was two months longer than her marriage lasted. I had better luck with Mildred, who pointed out Tom and said he’d be a good match for me. She was right. So I’ve stuck with Mildred. I was on my way to her house when I heard about the whole business. I had James in the stroller—ten months old, I think he was—and we were enjoying the early autumn breeze, walking out to the edge of town, beyond the old power station, where Mildred’s cottage was set way back from the road. We were in the part of town where the officers’ housing left over from the war had been remade for families when I heard someone call me. It was my cousin Sylvia, and she was waving to me from her porch, the one Tom fixed up for her after her mother died. When I looked up at her, she waved frantically for me to come closer. “We’re on the way to Mildred’s,” I told her as I wheeled the stroller up the flagstone path. “Can’t we sit on the porch?” To tell the truth, I never much liked the inside of my aunt’s house. She’d kept it dark and cluttered it with her many incomplete projects—piles of quilt squares and rolls of material for dresses that never quite got done. She sat down, but drew my chair very close, so our knees were almost touching. “It’s about Mildred,” she whispered. “And how did this happen?” I could feel the warm blood rushing to my face. I waited. When Sylvia said that it meant she couldn’t wait to spill the tea. I was on my feet. “Thanks for the information, Sylvia,” I said as calmly as I could. Then I directed the stroller towards the steps and bumped it down by myself. “Don’t get involved, Charlotte!” she shouted after me. I kept moving on the path and pushed the stroller down the street to Mildred’s. Mildred’s cottage was small, made of stones her family had gathered for who knows how long ago. The garden had been tended by four generations of Mildred’s family, and still produced the best vegetables in the area. They’d been the first family to build solar panels, even when the rest of the town had oil and gas to burn. “Just makes sense,” they’d replied to those who’d laughed at their eccentricities. It was something Mildred herself often said. Mildred saw Charlotte pushing James in the stroller through the trees towards her door that morning and turned to put on the kettle for tea. Out in the garden, she picked peppermint leaves and waited for her young friends. Once they were inside the cottage, Mildred placed the peppermint in a teapot and the chamomile in a small jar. She took the whistling teakettle off the stove and poured the water carefully into both. “I treasure them. What a very serious little girl you were. Just ten, weren’t you?” She poured the peppermint tea into the cups. “Never.” Mildred shook her head. She watched as Charlotte sipped her tea. She noticed that, although James was playing with his hands and making happy sounds, Charlotte was watching him with what looked like concern. “Is there something else you need, dear?” Mildred asked. Charlotte breathed out slowly as she closed her eyes. Mildred looked at her intently and kept a hand on her forehead. Then Mildred closed her eyes. An old woman, stooped in her garden. She rises and greets a young girl who’s crying, pulling an old bicycle. She’d fallen, badly gashed her knee, and come to the first house on the road. The old woman washes the knee carefully, offers the girl apple cider made from the trees out back. Before the girl leaves, the old woman sings a chant over the bicycle, wishes of safety and happiness. Mildred took up the deck and placed three cards on the table before her. The Empress. The Emperor. The Tower. Charlotte looked at the picture and gasped. The broken tower, struck by lightning, two terrified people falling to certain death. “But the future may be destruction of the present order—the downfall of the dominators.” She swept the cards back into the deck. Mildred smiled and shrugged her shoulders. Mildred looked through the deck and drew out three cards. “The Ace of Wands first,” she said, “and that’s an indication of a new venture.” She placed the card before Charlotte, so she could see the image of the hand in a cloud, grasping a wand with blossoms on it. “And then the Ten of Cups, domestic happiness.” Charlotte saw the young couple, arms around each other under a rainbow of cups, their children dancing beside them. Charlotte smiled at the naked cherub riding the horse in the foreground, images of flowers under a beaming sun behind it. As Charlotte looked at the cards, Mildred leaned over to James in the stroller. She picked him up and placed him gently on her lap. The room fell silent, and the men on the dais looked down at their notes. The Council Chair, a balding man in his sixties, coughed and then spoke again. “Let’s just deal with this evening’s business, sir. There’s quite enough to do. Now, there’s been a serious charge against one Mildred Cosgrove, who is accused of casting a birth spell. And I take it her accuser is here, but not the accused?” He lifted his glasses to check the hall. Agnes stood and walked to the front of the room, before the assembled Council. “You must speak, ma’am, so we can make your response part of the record,” the younger man said. The Chair turned with a withering glance to his right. Then he looked back to Agnes and nodded. Charlotte rose, handing James to her husband. She walked towards the front of the assembly, her legs trembling. “Yes, sir. Before the next spring,” she said. “What were the cards?” Agnes repeated. “Let me search her,” Agnes said. She approached Charlotte and put a hand to her forehead. An old woman at a table with a young woman, showing her the cards. The Ace of Wands, that’s an indication of a new venture. The image of the hand in a cloud, grasping a wand with blossoms on it. And the Ten of Cups, domestic happiness. A young couple, arms around each other under a rainbow of cups, their children dancing beside them. And this is the most important, for me, at least—The Sun. That’s the baby card, my dear. Birth before the next year. Always. “Would you repeat that for the Council, Agnes?” said the Chair. Charlotte looked to Tom and James in relief. She nodded and wiped tears from her cheeks. “Are you certain?” asked Agnes. At home, Mildred sat at her table. She spread the tarot deck face down before her. She asked, “Outcome?” and chose a card. 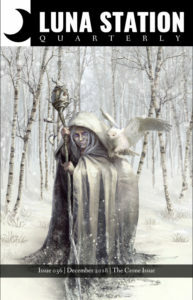 It was The Magician—a figure standing confident and sure, wielding the arcane symbols of the tarot. The skillful accomplishment of a goal. Mildred laughed softly. Good enough, she thought. For today at least. She poured peppermint tea into her lopsided cup and drank it. Regina Higgins has written stories published at Everyday Fiction and Rainbow Rumpus. She’s also the author of Magic Kingdoms, a book about classic children’s literature, published by Simon & Schuster. She lives in Lexington, Kentucky, with her husband and is writing a novel.